Thank you for stopping by FunCakes and checking out our blog. We get a lot of questions about our fake cakes and can you save money? Of course you can!! We will help you decipher the Wedding Cake world below, broken down into four categories to help you choose the most important cake of your life!! If you look at the write up with each cake on our site, you will see we have included information on how many guests this cake would feed if it were real, after all, you do want it to look real !! You don’t want to have a wedding of 250 guests and the cake would actually only feed 80 people, in the same sense, you also don’t want a cake that would feed 450 guests and you’re having 100 guests. So we try to help you locate the correct size of the cake that would correlate to the number of guests your having. 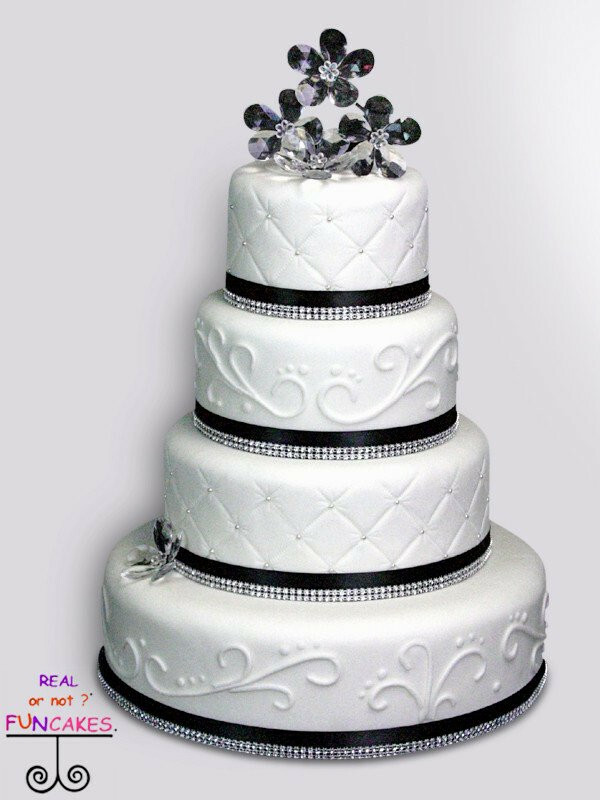 For the Wedding Cake picture shown with this blog, Classic Black, it is a four tier cake at the standard 4″ tall tiers, it would feed 155 guests. Once you have determined the correct size, then comes the cost. 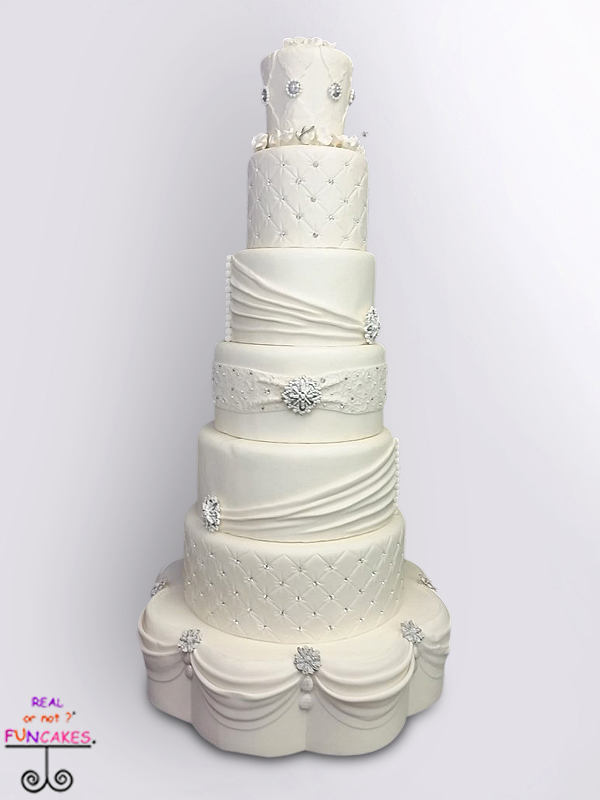 Wedding Cakes are priced by the numbers of servings. So for instance, if you choose a three cake that feeds 80 guests and you pay $5.00 a slice, the cost would be $400.00. The average cost of a slice of cake varies depending on where you live. In NYC you could be paying $25.00 a slice , where as a home baker you could be paying as little a $2.00 a slice (as they have no overhead, minimal knowledge, so you also get what you pay for). Also is the cake buttercream or fondant? You pay more for fondant as it is an extra step. 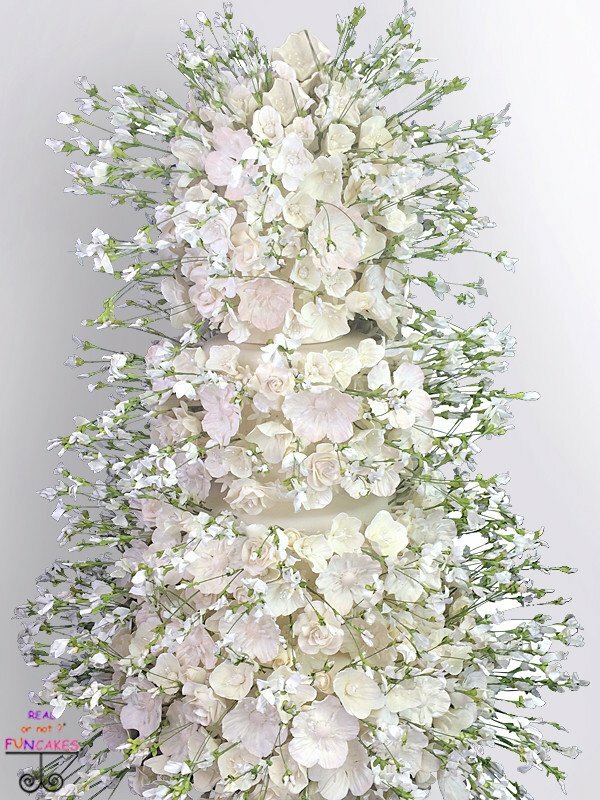 We do have a couple of cakes on our site that are $5.00 a slice but this is because of all the handmade sugar flowers involved, one cake has 3000 sugar flowers,and that is not a typo 🙂 For the Wedding Cake picture shown with this blog, Classic Black, a four tier cake at the standard 4″ tall tiers, we are charging $1.98 a slice due to all the detail work. On the subject of cost, I would like to let you know that the prices of our cakes INCLUDE a security deposit. Just like when you rent the tuxedo, you pay for a security deposit. The security deposit ranges from $99.00 to $250.00 , depending on the size of the cake. So please read through all the information with each cake. If you choose to return the cake you will get this deposit back ( obviously it needs to be in good condition). Finally, venues are now charging to cut the cake and serve it, from $1.00 – $2.00 a slice. So remember to check your venue so you aren’t surprised at the end of the day. With a FunCake you are feeding sheet cakes to your guests, so there is normally not a charge for that, as sheet cakes are easy to cut and serve. Bakers will charge a delivery fee on top of the cake cost. In our area this averages at $50.00 but again that would fluctuate depending on where you are living or the distance involved. All our shipping is free across the continental USA. We do ship world wide, so check with us on the cost to your country. This is the huge concern. 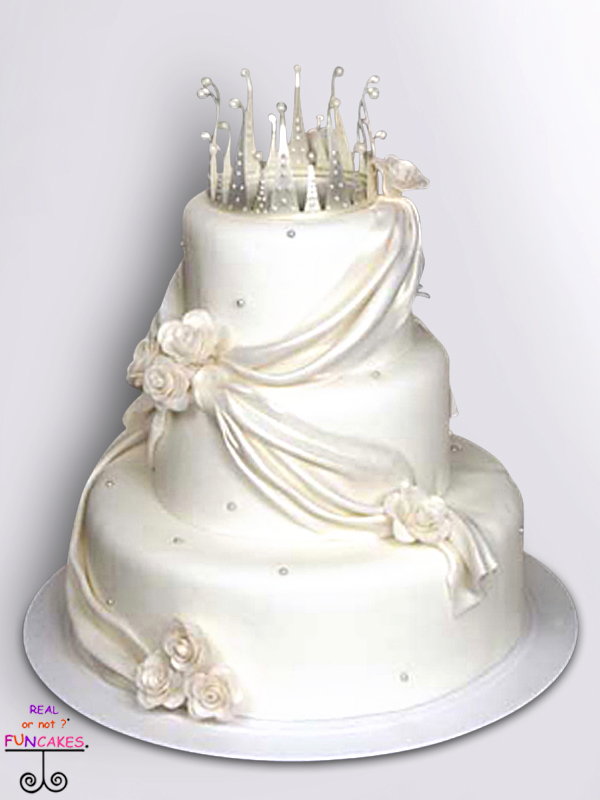 The average Wedding Cake is baked on Tuesday, crumb coated on Wednesday, leaving Thursday and Friday to decorate. Now your expensive Wedding Cake is 5 days old when it is served to your guests. Sheet cakes are fresh, made the day before you pick up. We have made cakes for $250,000 weddings, again no typo, because it was super important to the bride and groom to serve fresh cake. Also sheet cake is a clean pretty slice of cake on a plate vs someone not knowing how to cut a Wedding Cake and serving mangled up slices. There is an art to cutting a Wedding Cake, as you can imagine. So Aunt Sally,with no experience, may not be a good idea! 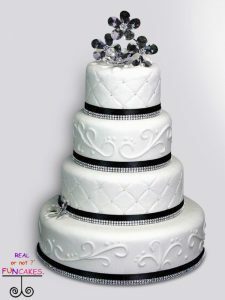 We hope this information helped you in your BIG decision for your Wedding Cake, the most important cake of your life !! We are here to give you an alternative to the $1000.00 wedding cake or maybe your serving pie but still want the pictures, tradition, cutting ceremony and a beautiful display on your sweets table? « We have a Winner ! !